A pair of riding stirrups worn by King William at the Battle of the Boyne have gone on public display for the first time. The historic 17th century artefacts were purchased by the Orange Institution in Co Londonderry from a private vendor, having previously failed to meet reserve price at auction in London last summer. The stirrups, originally owned by Charles I and dated 1626, will now take pride of place at the Orange Order’s heritage centre in Limavady. Aaron Callan, trustee at the Orange heritage centre, described the acquisition of the stirrups as a “massive coup” for Limavady, the north-west, and the local museum sector. He said: “We are delighted to have acquired such a prestigious artefact, given their direct association with one of the principal and revered figures of the seminal battle of the glorious revolution. The authenticity of the stirrups has been verified, and we are immensely proud to now be the guardians of such coveted horse furniture. 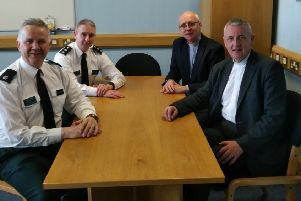 Mr Callan also confirmed there were several local links to the stirrups, reinforcing their connection with Limavady and the surrounding area. Following the Battle of the Boyne, King William gifted them to his aide-de-camp, General Frederick Hamilton, who had an estate in Londonderry. The stirrups, along with a pair of King William’s gloves and a saddlecloth, were subsequently inherited by the Cary and Beresford families (the former from Dungiven), before passing to the ownership of the Blacker family.